Here is an actual question I received about how to handle accounts receivable overpayments and underpayments. 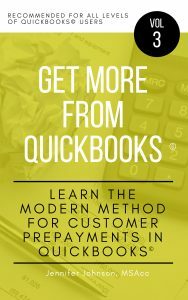 Hi Jennifer, I would like to know how to handle “old” transactions for accounts receivable overpayments and underpayments from customers in 2009. One is a .01 underpayment and the other .45 overpayment. I’ve spent hours trying different methods to get rid of these, but nothing works! Even tried a JE, which I’m sure I didn’t input correctly. Help – – please! If this solution is in one of your books, please advise which one, and I will be happy to buy it. I’m going to discuss your answer in the context of accounting theory. This will help you understand what is happening “behind the scenes” so to speak. In regards to A/R, a credit simply means that you received payment. Credits to A/R always lower a customer’s A/R balance with you. In your case, the credit lowered the balance to below zero. That’s why it is negative. Normally, your A/R customers have debit balances. A debit balance in A/R is a positive balance. This means they owe you money. When you have an overpayment, there is a credit balance. This means that you owe them money. It also means that in order to remove the credit balance from the books, you have to do so with a debit. Although there are a couple ways to do this, I find the easiest way is to go to the General Journal. Enter the appropriate date. In the Account column, choose Accounts Receivable. In the debit column, enter the amount of the over payment. Tab over to the Name column. Enter the customer’s name. Tab down to the next line. You will see that QB has already entered the offsetting amount as a credit. In the Account column, enter the account you want to write this off to. Since in your case it is so small, I would choose Miscellaneous (for larger amounts I recommend consulting with your CPA about what to do, because a refund may be due to the customer). Save the transaction. In order for these to stop showing on accounts receivable aging reports, apply the journal entry to the over payment. Do so by going to the Receive payments window. Choose your customer. Do not enter any other information, but notice that the journal entries appear somewhere here… not sure where it will appear on YOUR screen because there might be other activity for this customer. If there is no other activity then the journal entry will appear as the first entry in the box. Once you’ve located the journal entry, highlight it then click Discounts & Credits. Here you will see the overpayment. QB might choose it for you, if not choose it yourself. Click Done. QB adds a column called, “Credits,” to this window. The entries offset each other and you can click Save. It will now be removed from the A/R aging reports. Applying accounting theory for an underpayment uses the opposite concepts that the overpayment did. The underpayment results in the customer still having a debit balance with you… in other words, they STILL owe the money. But since it’s so small you don’t want to send an invoice. So you will remove this from the books by entering a credit to their A/R account. In order to write this off, go back to the General Journal. Enter the appropriate date. In the Account column, choose Accounts Receivable. In the credit column, enter the amount of the underpayment. Tab over to the Name column. Enter the customer’s name. Tab down to the next line. You will see that QB has already entered the offsetting amount as a debit. In the Account column, enter the account you want to write this off to. Since it’s so small I would choose Miscellaneous. If you are unsure, consult your CPA. Save the transaction. To remove it from the accounts receivable aging reports, follow the steps I outlined above. Hi Jennifer! THANK YOU SO MUCH! It is such a relief to finally get a COMPLETE answer! I explain all of this and and a lot more, with my customary emphasis on clear language, step-by-step instructions, full color screenshots, tables, diagrams, and analogies. Check it out and let me know what you think.